The 1930-S Indian Head Eagle is one of the rarest 20th century coins. The Indian Head $10 Eagle was minted from 1907 to 1933. Production after 1916 was very irregular, as the only years with output were 1920, 1926, 1930, 1932, and 1933. The mintage of the 1930-S Indian Head Eagle was a mere 96,000 pieces. No researcher has been able to ascertain why the San Francisco Mint turned out any $10 gold eagles at all that year, since there was absolutely no demand for them from the public. Of that 96,000 mintage, most of them were never released and eventually perished in the gold meltdown ordered by the Franklin Roosevelt administration during the 1930’s. Most melted gold of that era ended up at the national bullion reserve at Fort Knox, Kentucky. Consequently, only a tiny number of 1930-S gold $10 coins exist today. Coin experts estimate their number at no more than 150 examples. The 1930-S rates as one of the rarest 20th century coins and as a track record of price increases to substantiate this claim (see chart below). 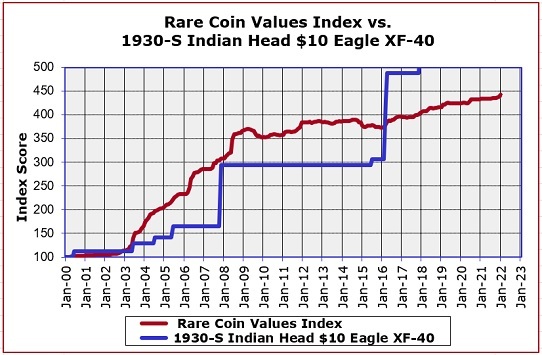 The percent value increase since Year 2000 of the 1930-S Indian Head $10 Eagle in XF-40 condition is shown in the graph above by the blue line. In Jan 2008, the coin jumped to three times its value compared to Jan 2000. The red line charts the progress of our Rare Coin Values Index, which depicts the composite percent change since Year 2000 of a pre-selected group of 87 rare US coins, the purpose of which is to understand the strength and direction of the overall rare US coin market. The 1930-S Eagle is one of the 87 coins tracked in the Index. All Index data is updated monthly.